Equibit Development Corporation, creator of the Equibit Blockchain and Blockchain applications for the global securities industry, said it plans to raise as much as $7 million in an initial coin offering, one of the largest on record by a Canadian-based company. The sale is set to begin Feb. 1. EDC is offering to sell one million equibits or EQBs, a new digital asset, out of a total of 22 million equibits potentially available. 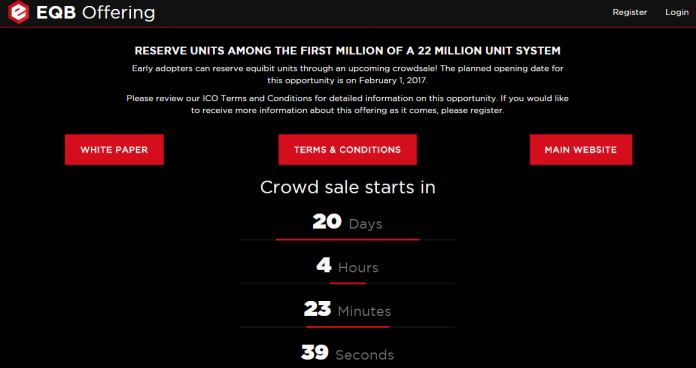 The sale, which will run for 59 days to March 31, will be conducted on a special sale page at EDC’s website. Purchased equibits will be delivered to user accounts at EDC’s web wallet service, which is planned to launch concurrently with the release of the Equibit software later this year. EDC will retain any unsold equibits, as according to the sale’s terms and conditions. Proceeds will be used to expand EDC’s team of developers, accelerate product development, support and expand the network of equibit supporters, install enterprise infrastructure such as supernodes and market Equibit Blockchain applications. The offering will be partitioned into batches of 100,000 equibits, with the price schedule starting at $2 per coin. Keeping to a predetermined schedule, the price for equibits will increase with each batch. For information on participation in the sale, please see the EDC website. EDC’s complete white paper is available here and at Cornell University’s arXiv e-print archive.